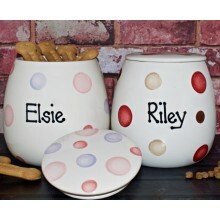 Our selection of dog treat jars come in a variety of shapes, sizes, colours and finishes from nickel plated, ceramic, personalised and even storage jars with your dog's name and portrait. The perfect way to store your dog's treats (including ours!). 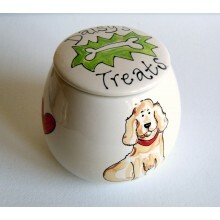 Treat your dog to his or her own unique personalised treat jar. This wonderful hand-painted do.. 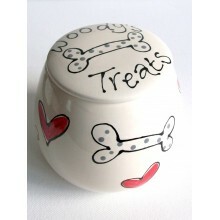 Treat your dog to his or her own unique personalised treat jar. This wonderful bespoke dog tre..